The earthy combination of warm and cool colors in this palette is particularly attractive to me. I love the cool gray with yellow and shades of pink and orange. What would you make with these fabrics? LOVE this color palette! I think a skirt with contrast pockets and definately a dress out of the butterflies! Still looking forward to the release of the women’s Hide and Seek dress!!! Beautiful choices, especially the artic sunset fabric. I think the everyday skirt would be beautiful in this palette. I’d love to stitch some of these beauties into a sweet roller skate dress! I love a grey with colors. It provides a great soft contrast. 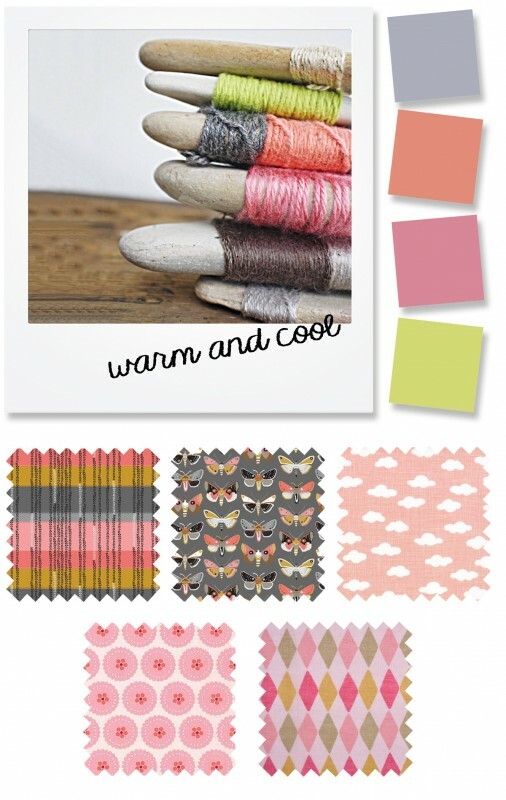 I remember pink and grey colour schemes in the 80s! But they weren’t as nice as these! I’d make a reversible roller skate dress and an everyday skirt for me. 🙂 I still have yet to bust that pattern out. I love these too! Everyday skirt out of the moth print for me! Beautiful colors, I would sew the Hide and seek dress with a solid panel from the Arctic sunset, Bubble dress from the Mariposa, Lullaby Layette jacket from Storybook clouds, 2 + 2 blouse from the Hothouse flowers and a Fairy Tale from the pink and green diamond. The clouds on pink look perfect for summer pjs or a night gown.